Add trending news to your website in order to engage your audience, boost click-throughs rates, and improve your SEO rankings. Providing relevant content and links in pertinent categories will help improve the search engine ranking evaluation ofyour site for both Google and Bing. This plugin is a quick and easy integration into any WordPress site. Follow our four simple steps and effortlessly add curated streaming news to any page just by pasting in some simple WordPress short code. Want complete control over the functionality and appearance of trending content? Use our simple REST API or a simple RSS feed. All functionality is available through simple HTTP calls. Providing timely and unique content attracts visitors to your site. Google observes and monitors sites for “freshness.” Content channels update every 5 to 10 minutes, ensuring relevant and popular content is associated with your site. a dynamic content channel. Providing engaging content keeps users active on your site for a longer period of time. Creating quality content can be time-consuming and overwhelming. Over 900 trending news categories are currently available and each one can be filtered into hundreds of additional subtopics. Added the Wordpress Plugin to the RadioIO website and streamed trending music news for the last 24 hours, week, month, and year. The content was given its own dedicated trending news page. 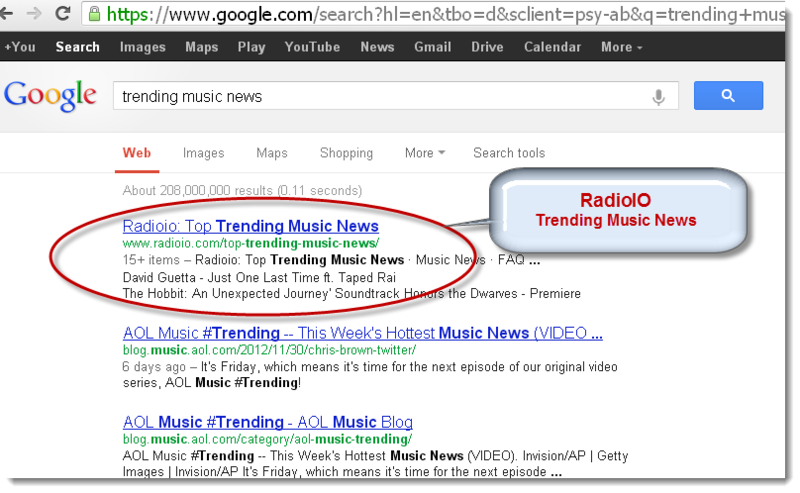 searching for trending music news, RadioIO’s trending music page appears as one of the top Google search results. Click the "Request Info" button to submit a request to get access to the WordPress plugin or REST API. During this process we will confirm which categories of content you need for your target audience. After this is confirmed we will give you the instructions to integrate the trending news onto your site.